Lanterns: Did the Satanist G.O.P. Turn their Mascot's Stars Upside Down? This claim has popped up from time to time and for the most part I have laughed it off because well... its pretty silly in my humble opinion. 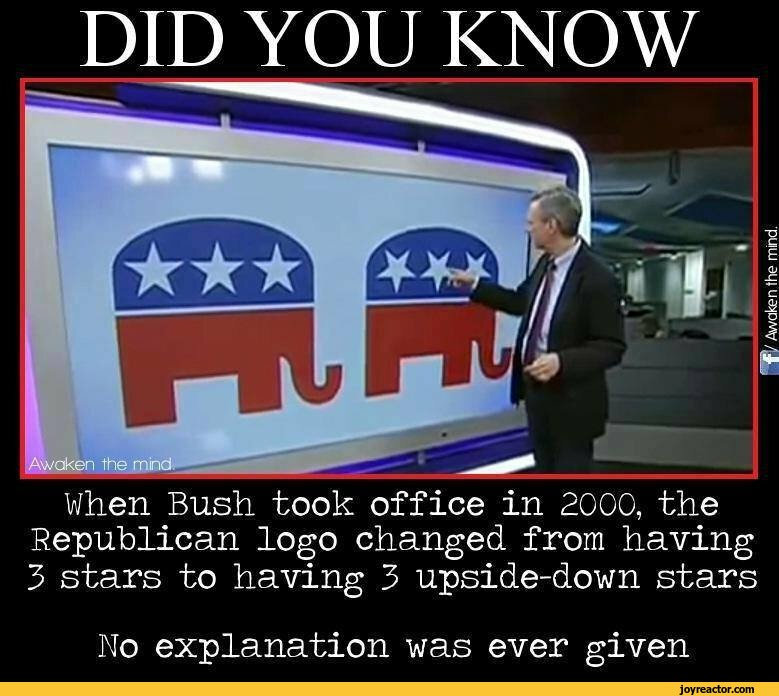 The GOP (meaning Bush 43 primarily) turned the three stars on the mascot upside down as a "secret symbol" that they are all Satanists. First off an upside down five point star (pentagram) is a very well known symbol of Satanism so there really can not be any "secret" symbolism to it. Nit picky I know but it ties in later. So first off lets look at the mascot itself. 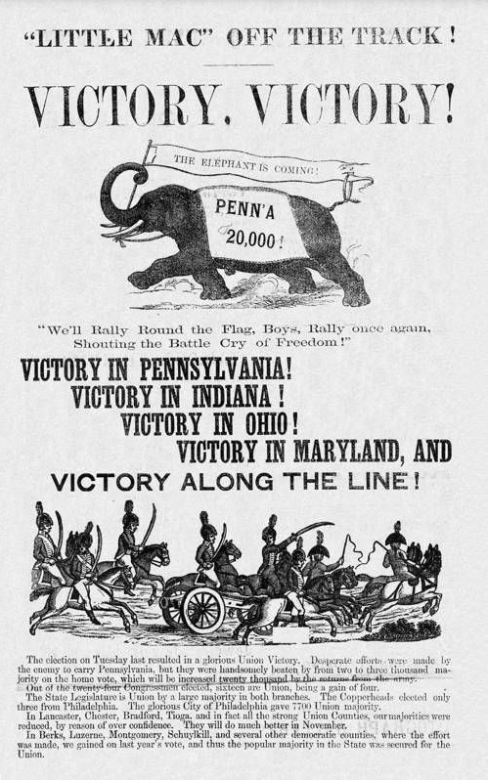 The first reference I found connecting the elephant with the GOP was this 1864 ad celebrating Abraham Lincoln's re-election as president, an elephant is shown under the headline "Victory, Victory!" This image was published in Father Abraham a pro-Lincoln Republican newspaper . 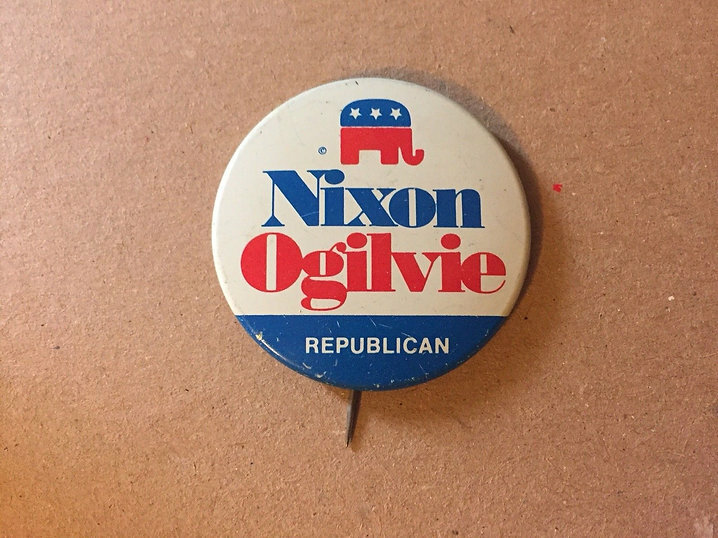 This however according to history was not the link that made the elephant the GOP mascot. 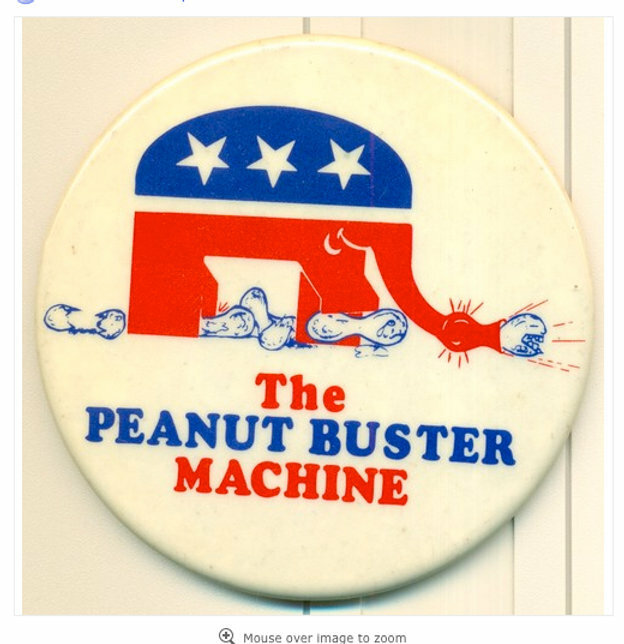 That honor goes to an 1874, Harper's Weekly cartoonist named Thomas Nast who drew a caricature of the Republican Party represented by the Pachyderm. 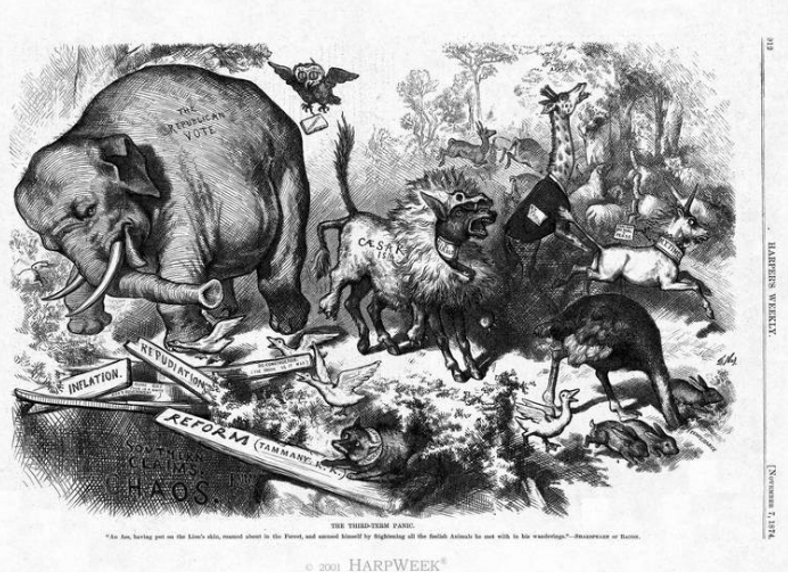 This cartoon published before the 1874 mid term elections showing an elephant falling into a pit was prophetic. The Republicans lost the house. Over the years Nast published several other cartoons with the GOP represented by the elephant indelibly linking the two together. 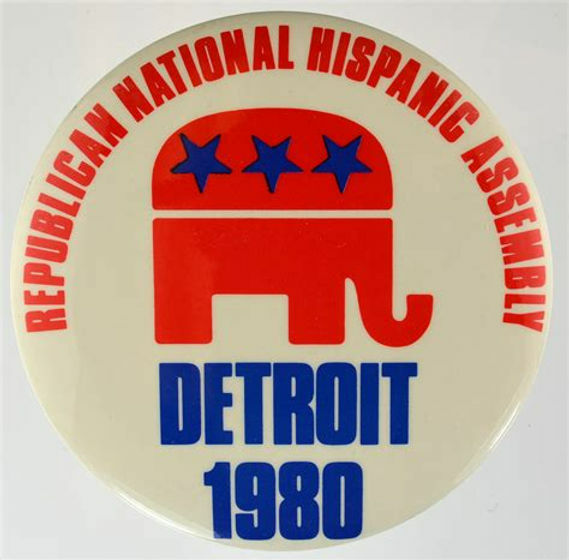 The republicans eventually adopted the symbol and began officially using it as their mascot around 1877. It is important to note that Nast's cartoons were also responsible for the Democratic party being represented by a Jackass. (We must use the terminology of the time for emphasis.) 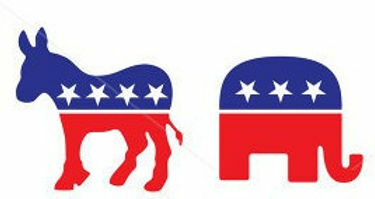 It originated by Nast's view of Andrew Jackson (founder of the Democratic - Republicans which became the democratic party) as a "stubborn jackass" and shifted to represent the party as a whole. The Democrats though were far less enthusiastic about adopting their mascot. 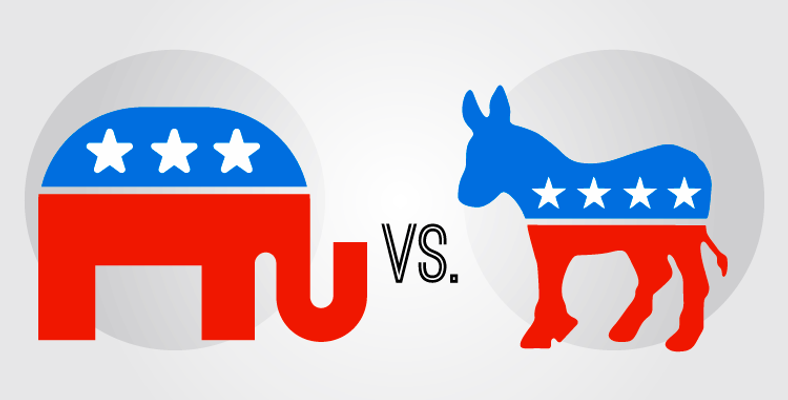 During the age of television when politics invaded peoples living rooms with the evening news, the elephant (and jackass) symbol was trimmed down and became more stylized to fit the times. There have been many, many versions of this logo over the years but this is unquestionably the most common one. So as we can see this particular rendition has the three stars in the upright position which is believed to symbolize pointing to heaven. The opposite should be fairly self explanatory with the pentagram (upside down 5 point star) being by many recognized as a satanic symbol. Now around 2000 after Bush 43 was inaugurated we started to see the claims that Bush had changed the stars to be in the upside down position to show his connection to the occult. This of course soon encompassed the entire republican party resulting in them being labeled Satanists by many. Primarily you know who, the MSM and the Democrats. And it seems to be being picked up again today by social media in memes. Like the one below provided by the person who requested I look into this. 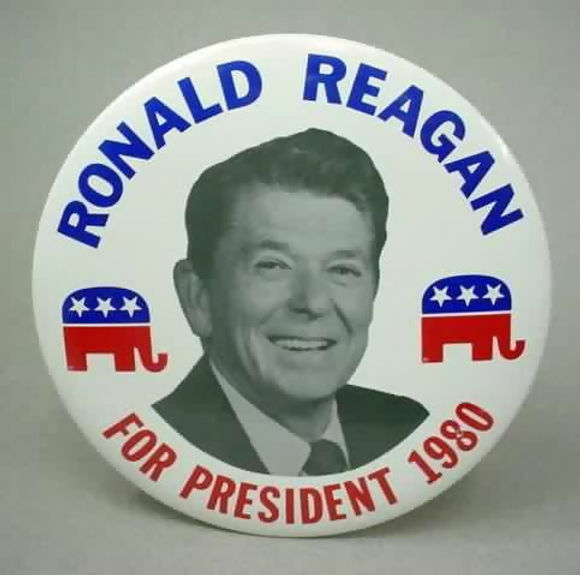 So first I guess we need to see if there are any other images of the republican party symbol prior to 2000 with the stars in the upside down position. 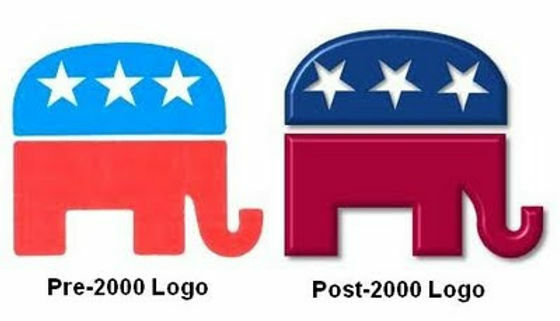 If there are then we can establish that 2000 was not the first time this version of the image was used by the party, meaning also that the Bush 43 theory is pretty much dead in the water. The answer to that question is... why yes it was. And I also found that the position of the stars varies from individual state and organizations associated with the GOP, RNC etc. as well. But I am not going to post them all here. I found them very easily so everyone else can as well. The following image is an example of this. 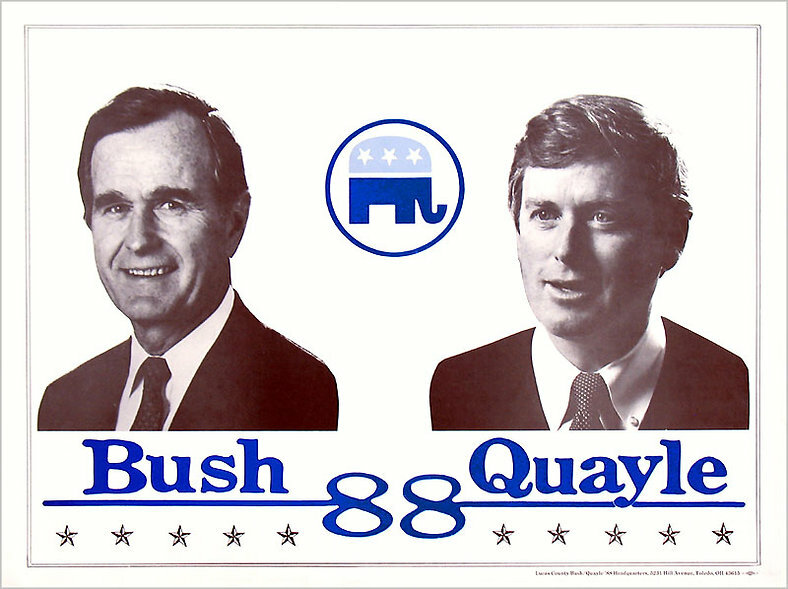 Even here the image predates the supposed "change" that Bush 43 made in 2000. Previous to 2000 I found just as many images with the stars upright as I did images of them upside down. The same goes for post 2000 leading me personally to believe that this is all just another case of trying to manufacture a scandal where one does not exist. I did say that I thought this was all pretty silly. We have come to expect this from the Democrats after all, its kind of what they do. It still comes down to what each of us chooses to believe though as always. 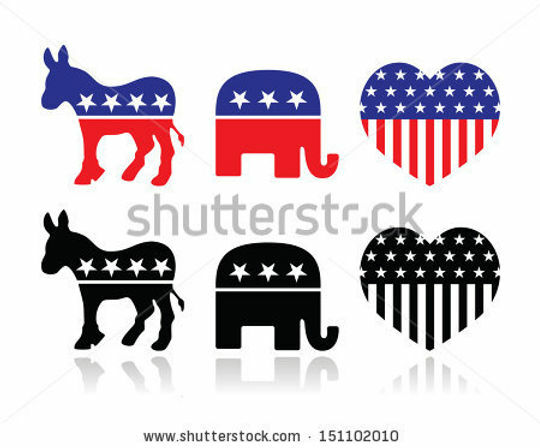 One can choose to believe that there was a great conspiracy and "secret meaning" behind the stars on this little red white and blue pachyderm being shown as upside down (pentagrams). Or with a little common sense we can deduce that it is most likely just a random placement by the many different people hired to print the images.